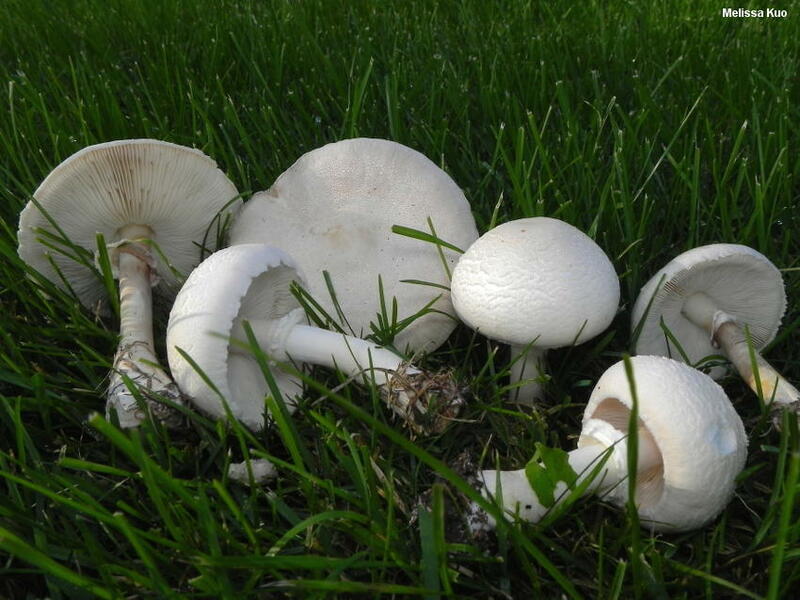 This common mushroom, also known as Leucoagaricus naucinus and, in older sources, Lepiota naucina, appears in lawns across North America--typically in fall, but occasionally in spring and summer as well. 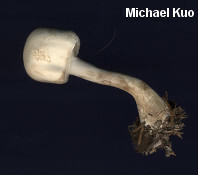 It is recognized by its white gills, white cap, and white ring. 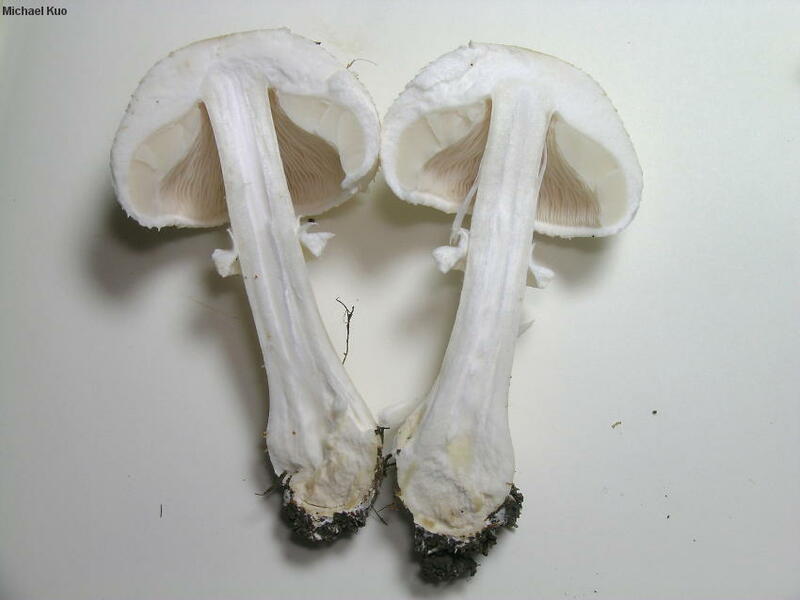 It lacks a universal veil, so it does not features warts or patches on the cap, nor a volva at the base of the stem--but it could be easily mistaken for an Amanita on casual inspection. One of its most distinctive features, in my opinion, is the odd shape of the young cap, which, while basically convex, is rather a lumpy version of convex. Some forms of this species bruise yellowish or brownish on handling, and the stem is usually club-shaped--but these features are variable enough that they should not be relied upon for identification. Under the microscope Leucoagaricus leucothites features dextrinoid spores, along with cheilocystidia that strive not to be boring, but don't quite reach their goal. Leucoagaricus leucothites has a nearly global distribution, occurring primarily in urban, cultivated areas. Vellinga (2004b) theorizes that "[t]he fact that La. leucothites spores germinate easily, and on a wide range of substrates (including water), may explain why this species is able to colonize man-created areas world-wide." 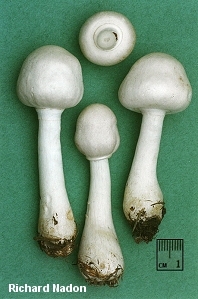 Ecology: Saprobic; growing alone or gregariously in grassy areas or on disturbed ground (roadsides, cultivated areas, and so on); often in the vicinity of conifers (the most impressive fruiting I have seen occurred in a lawn where a spruce tree had been removed the previous year); occasionally appearing in woods; late summer through fall (but sometimes found in spring); widely distributed and common throughout North America. The illustrated and described collections are from Illinois, Michigan, and Québec. Cap: 5-9 cm; convex or irregularly convex when young ("lumpy looking"), becoming broadly convex, broadly bell-shaped, or nearly flat; dry; minutely to finely or moderately scaly, especially when young--but often becoming bald with age; soft; white or grayish white when fresh; sometimes staining and bruising yellowish to brownish, especially along the margin; the margin not lined. 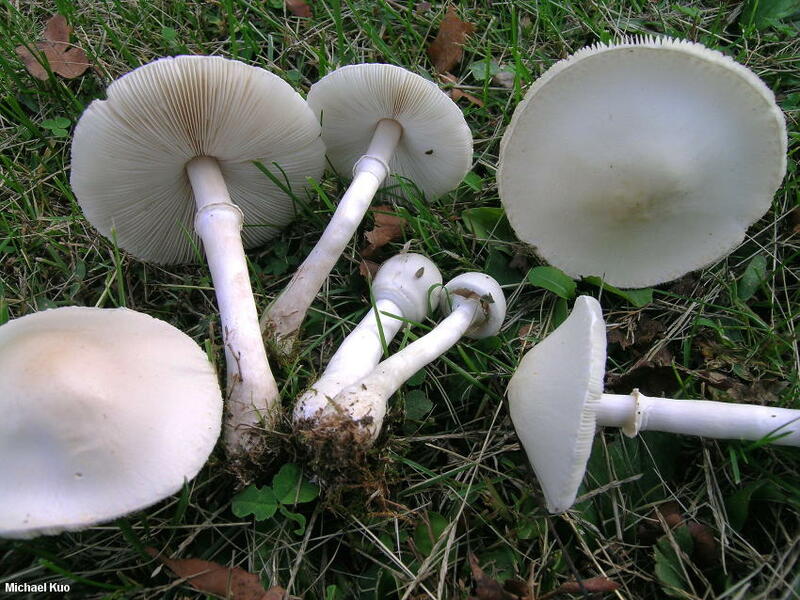 Stem: 6-10 cm long; 1-1.5 cm thick; usually club-shaped; dry; bald; discoloring and bruising yellowish to brownish; becoming hollow; with a white ring on the upper stem that is fairly persistent but may fall away. 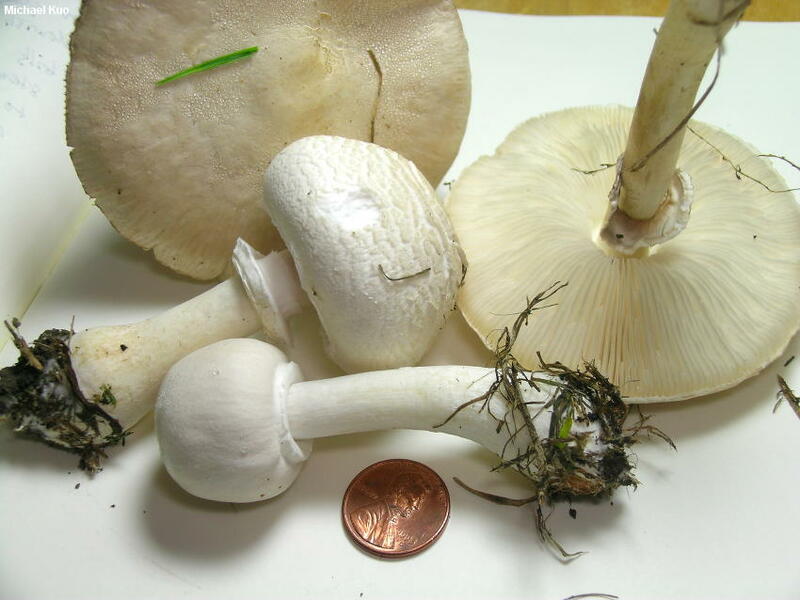 Flesh: White; not changing when sliced, or staining yellowish in the stem base. 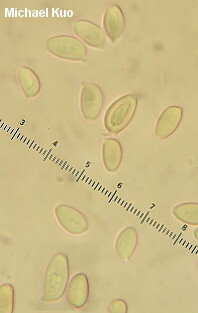 Microscopic Features: Spores 8-11 x 5-6.5 µ; amygdaliform to subellipsoid; thick-walled; with a tiny pore; smooth; hyaline to yellowish in KOH; dextrinoid. Cheilocystidia 35-45 x 7.5-10 µ; subcylindric to subclavate, subutriform, or irregular; thin-walled; smooth; hyaline to ochraceous or golden brown in KOH. Pileipellis a collapsing trichoderm of cylindric, occasionally septate elements 5-10 µ wide; hyaline in KOH; terminal cells tapering to a subacute apex; pileipellis at center of young caps also containing multi-septate, cystoderm-like elements. REFERENCES: (Vittadini, 1835) Wasser, 1977. (Fries, 1838; Saccardo, 1887; Kauffman, 1918; Kauffman, 1924; Smith, 1949; H. V. Smith, 1954; Smith, 1975; Smith, Smith & Weber, 1979; Weber & Smith, 1985; Arora, 1986; Phillips, 1991/2005; Lincoff, 1992; Breitenbach & Kränzlin, 1995; Barron, 1999; Vellinga, 2001d; Roody, 2003; Vellinga, 2004b; McNeil, 2006; Miller & Miller, 2006; Trudell & Ammirati, 2009; Kuo & Methven, 2014.) Herb. Kuo 09129401, 09150720, 09201402.